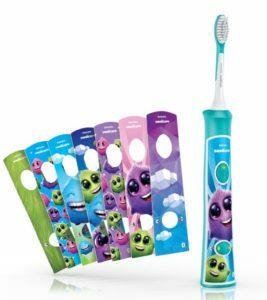 Sonicare For Kids – A Parent’s Dream Come True! It’s tough to get kids to brush their teeth. Tougher yet to have them do it properly – and twice every day. That isn’t hard to understand. After all, brushing teeth isn’t fun. Or is it? Realizing that this is a universal problem, electric toothbrush manufacturer Philips Sonicare set its best engineering minds to solving it. The result is Sonicare for Kids (Model: HX6321/02 ). A rechargeable electric toothbrush designed specifically for children aged three years and up. When you come to think of it, there’s nothing really clever or cute about the Sonicare for Kids line. It’s just… fun! What’s In The Sonicare for Kids Box? There’s also a manual of instructions to help your child get started. Note: If you take up the offer to register your brush online, you can extend your warranty by six months, over and above the 2 years you get for free. The white and aqua blue colored toothbrush handle looks like any other Sonicare toothbrush handle out of the box… but there’s a lot you can do with it to make it more attractive. The white space in the handle can be customized with stickers to give it a unique look. The more exciting his or her toothbrush looks, the more likely your child is going to be about cleaning teeth with it. The Sonicare for Kids package includes colorful stickers to let you achieve this end. There are different kinds of stickers for girls and boys. Designs and pictures of smileys, clouds and monster hair can be stuck on to the removable panel. Just peel off the sticker and apply it to the handle. All it takes is a minute. Then attach the panel directly to the brush handle. The adhesive on the panel can be washed and reused over and over. Sonicare for Kids comes with additional sets of stickers. On front of the handle are two rubber buttons. One is to power up the device. When this kids electric toothbrush is turned on, you’ll see a green indicator on the button light up. The other button is lower down on the handle. It helps you change the user modes for brushing, switching quickly and conveniently between gentle and regular modes. When you switch modes, an indicator lights up to show which mode is active – gentle, or regular. Specially for Sonicare for Kids electric toothbrushes , the speed settings are designed to be toggled only when the brush is turned off. While brushing, pressing the button won’t do anything – which keeps kids from playing instead of cleaning their teeth! On the bottom of the handle’s base is a hole into which the charger plug fits. The specifications of your toothbrush such as model number and type of battery are also printed on the bottom, making it convenient to check in case of doubt. The back is rubberized for better grip and to prevent children from accidentally dropping it. Tiny bumps on it improve the child’s grasp on the brush. And a finger guard near the neck of the handle also aids in this. None of the other popular sonic toothbrushes for children have a finger guard or child-friendly grip design to the handle. At the top of the handle is a shaft to snap on the brush head. When you slide a brush head on to the handle, you’ll hear a soft click when it snaps into place. To remove the head, just tug sharply. In the pack when you purchase a Sonicare for Kids electric toothbrush, you’ll get one brush head of standard size. The bristled area on a regular head is almost the same as a manual adult toothbrush. Bristles are soft and have a mix of long and short strands, each serving a different purpose. The shorter bristles are to rub on teeth more firmly and remove plaque. The longer bristles help reach between teeth and clean more effectively. If you think it’s too large to fit into your child’s mouth, then you can get a Sonicare for Kids compact brush head that is only half as big and makes brushing easier for smaller children. For more details, you can look at the Philips Sonicare brush heads catalog on their website . By having a coating on the back of a brush head made of soft rubber, the Sonicare for Kids toothbrush is more comfortable and doesn’t hurt when the back of the brush touches your child’s teeth… though it does tickle, so your toddler may squeal and squirm as you help clean his or her teeth! A minor problem with the brush head is that the bristles stain easily. If you brush your child’s teeth shortly after a meal or snack of cake or chocolate, you may have to spend some time cleaning the brush head thoroughly. Otherwise, the bristles will soon become discolored. The brush head comes with a protective cover, so that you won’t accidentally ‘flavor’ it with deodorant or aftershave! It also keeps the brush hygienic and clean, preventing infections and contamination. The brush head will need replacing every 3 months. Refill packs are available in all types and can be ordered online or bought from a retail outlet. Important caution: With the Sonicare for Kids sonic toothbrush, you can only use Sonicare for Kids brush heads, not other adult brush heads. This is the only product in the Sonicare line which has this limitation. So be aware of it while you decide to order this model . How To Recharge Your Sonicare for Kids Toothbrush? The Sonicare for Kids package, among the best Sonicare toothbrush models for children, includes a charging stand. It’s tiny and has a plastic rod that aligns with the hole on the bottom of the toothbrush handle. To prevent the stand from slipping, there are 3 rubber heads for friction on the bottom of it. The charger works with 100-240 volts power supply. This means you can take the Sonicare for Kids along on trips anywhere in the world. It is a unique advantage only available in Sonicare for Kids and not found in other child-friendly electric toothbrushes from other brands. The Sonicare for Kids recharges without any wires or cords. Just slip the handle onto the rod on the charger and it begins to recharge, with a beep and flashing light indicating that all’s well. The lithium-ion battery takes around 24 hours to charge fully, and it will then work for around 2 weeks before needing another charge. Some unique features that are found with the Sonicare for Kids line are designed to improve the experience for children. In the beginning, as your child gets used to the electric toothbrush, the slower brushing mode turns it off automatically after a minute. Then, over the next 3 months, the timer will steadily and slowly increase the brushing duration until it reaches the recommended 2 minutes. The only downside to the Kid Timer is if you want to brush your child’s teeth for longer than 2 minutes. In this case, you must manually turn it back on after the timer switches it off. Learning to use the sonic toothbrush can be a tickly problem – quite literally. The vibrating motion of the brush head can be strange, uncomfortable, and ticklish, particularly when cleaning behind your front teeth. Easy Start is a feature which ramps up the intensity of brushing over the first 15 sessions. Starting slow and working the way up to power-brushing mode makes it easy for kids to learn to brush with the Sonicare for Kids toothbrush. This is meant to appeal to smaller children who use the Sonicare for Kids. At the end of 30 seconds, the brush plays a few musical notes to let you know its time to move to the next quadrant. Not only does this make sure that all 4 quadrants are cleaned, it also naturally follows that your child will clean his or her teeth for the recommended two minutes as well. I’ve not mentioned this earlier because of the relative lack of value in most cases. But it’s a surefire way to get kids excited about brushing. 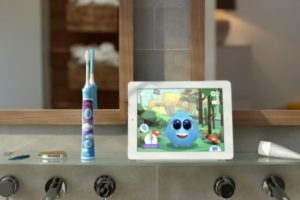 The Philips Sonicare for Kids app helps motivate younger users to brush. Once you sync the Sonicare for Kids toothbrush to your phone via Bluetooth, the daily routine of brushing becomes a game. While your child brushes, a furry creature mirrors his actions on the app. Digital rewards for sticking to the schedule and not missing a day help develop a good habit. For adults, this may not seem very exciting – but ask kids, and they all say they love it! Are There Problems With Sonicare for Kids Toothbrushes? Just a few. Or, actually, just one that’s worth keeping in mind. If your kid takes the toothbrush out of the mouth while it is powered on, there’ll be toothpaste and foam splattering all over the room. Other than this minor drawback, the Sonicare for Kids is a near-perfect choice for anyone with kids who wants to buy a sonic toothbrush. The only other model that comes close is the Oral-B Pro Health Jr toothbrush – but the Sonicare for Kids is a lot better. 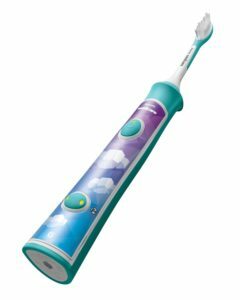 You can order the Sonicare for Kids toothbrush online from Amazon.com or pick it up from your local retail store. For more information about it, check out the Philips Sonicare official website – click here . To get more information about the Sonicare for Kids electric toothbrush, visit the official Philips Sonicare for Kids website.